Game Information: Cleopatra - one of the most famous Egyptians of all time. She was known for her beauty and being a fearless leader. 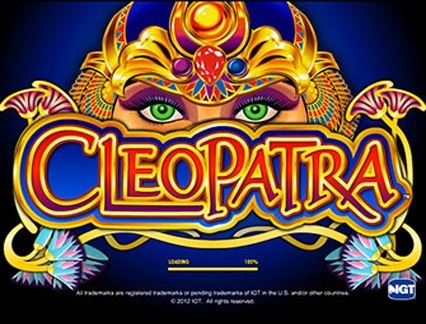 This pokie game from IGT, a well-respected software provider in the industry, has used the legend of Cleopatra as the inspiration for this 5 reel, 20 payline pokie game. The pokie is very visually appealing, and even though it is a somewhat older game, it by no means feels outdated. There are so many Egyptian-themed pokie games out there that it's hard for pokie games to stand out, but Cleopatra stands miles apart without even trying. Scatter Symbol: The Sphinx is the Scatter symbol and on top of being responsible for unlocking the Bonus Feature, it also can award up to 100x your bet for landing the symbols amongst the reels. Wild Symbol: The Wild symbol comes in the form of the beautiful Cleopatra herself. She can transform into other symbols. Keeping in mind that this game is a good few years old, it is definitely ahead of its time in term of graphics. Great attention to detail has been paid, and even the lower value card symbols have been ornately decorated. The other Egyptian-themed symbols are stunningly executed and the entire background whisks you away to Ancient Egypt in a heartbeat. The graphics are by no means 3D but they are still somewhat realistic and definitely visually stimulating. The reels have been designed so that they are big, bold and wins and losses are easy to see and follow. Sounds blend seamlessly with the images your presented with, and the cohesion is easy on the eyes and ears. The soundtrack for Cleopatra is undoubtedly Egyptian and the flowing acoustics are dramatic yet relaxing and there is definitely no reason to switch the sound off when playing this game. Standard Mega Jackpot: This jackpot can be won by any player if they happen to land 5 of the Mega Jackpot symbols in a winning combo. The award for this is a cool 10,000 coins, which exact amount in monetary value will depend on your wager. Progressive Jackpot- If you would like to be eligible for the Progressive Jackpots, you’ll need to do so under ‘Options’. Unlike the standard jackpot in the game, the progressive jackpot’s keeps changing and you can see the current amount (which is usually far more than the standard amount) in the top right-hand corner of the screen. Your chances for winning this life-changing sum are much higher if you are wagers are higher. But you can always win this jackpot in the ‘Second Chance’ feature which will randomly give you a chance to win this jackpot even on a non-winning spin. Free Spins: Free Spins are a popular feature in the world of pokies and they are definitely worthy of all the fuss. 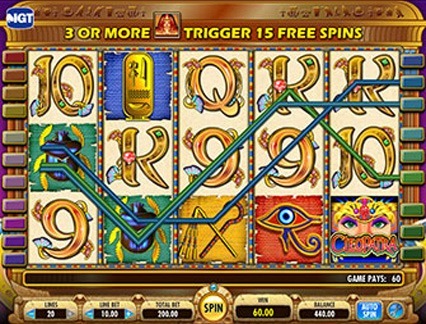 In Cleopatra, the Free Spins Round is activated when you land 3 of the Sphinx Scatter symbols anywhere on the reels. Depending on whether you land 3, 4 or 5 Scatter symbols, you’ll be awarded 5, 10 or 15 Free Spins respectively. The Free Spins Round is back dropped by Cleopatra’s famous bath. The reels are flipped in this Bonus Round and the best news is that your wins are all tripled! On top of that, if you land additional Scatter symbols within your Free Spin Round, you’ll be awarded more free spins. This can keep occurring until you have reached the limit of 180 Free Spins. Double Wild: This unique special feature is activated when the fourth reel is filled with Wild symbols. The game will automatically duplicate this reel, now providing two entire reels filled with Wild symbols, which will definitely enhance your winning chances.